nuqneH! Bored of standard vacations to places like Risa or Wrigley's Pleasure Planet? Want to discover a unique and ancient culture not bound by standard niceties and social mores? 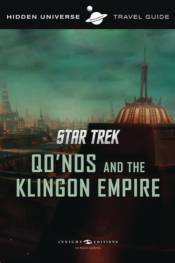 Then Qo'noS and the vast Klingon Empire are for you! This one-of-a-kind travel guide will give you all the information you need to plan, enjoy, and survive your trip to the very heart of Klingon territory, from an overview of Klingon history to tips on what to wear (fur and leather are very popular) to a glossary of important phrases like 'mamI' DaneH'a'? nItebHa' mamI' DaneH'a'?' (Would you like to dance with me? ).